The JBC's content describes proven or experimental procedures in medical and scientific illustration, medical and natural science photography, digital imaging, data visualization, animation, game design, instructional design, and other communication modalities. The Journal of Biocommunication, now hosted by the University of Illinois Chicago Library, supports a mixed-publishing environment, including both traditional and open access (OA) licensing. The Journal continues to seek scholarly articles and content relating to the visual communication of science and medicine. JBC articles and selected content will be included in PubMed Central. 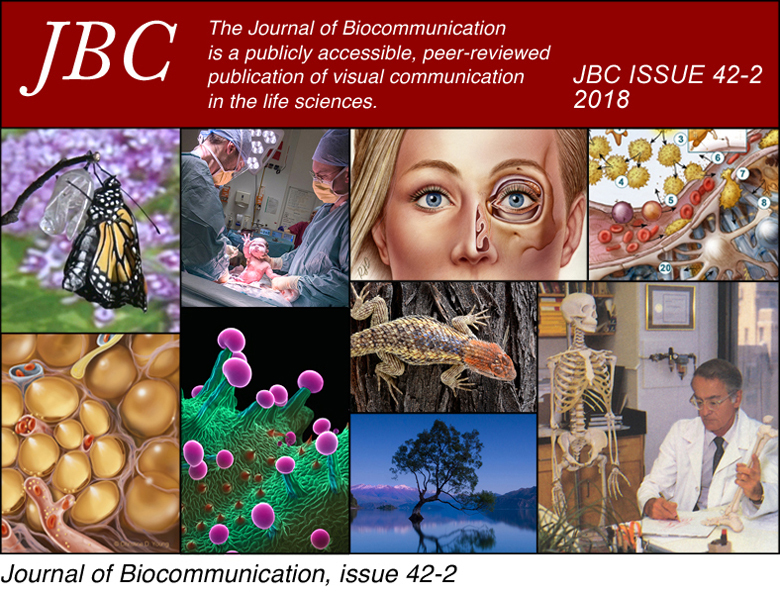 The Journal of Biocomunication (JBC) is a publicly accessible, peer-reviewed publication of visual communication in the life sciences. The JBC's content describes proven or experimental procedures in medical and scientific illustration, medical and natural science photography, digital imaging, data visualization, animation, game design, instructional design, and other communication modalities. We welcome manuscripts from academicians and practitioners about ongoing reserach, practice models, and academic research. The Journal of Biocommunication, now hosted by the University of Illinois Chicago Library, supports a mixed-publishing environment, including both traditional and open access (OA) licensing. The Journal continues to seek scholarly articles and content relating to the visual communication of science and medicine. JBC articles and other selected content will be included in PubMed Central.